features Chef Gunther Emathinger and culinary news, tips, recommendations and recipes from Orange County restaurant chefs. In this issue, our Produce Pick of the Month is Nasturtium. Nasturtium meaning nose twist refers to the sharp peppery taste of the flowers’ leaves. These blossoms tend to pair well with cream cheese, fish, salmon, vegetables or salads. Our featured book this issue is The Upstart Guide to Owning and Managing a Restaurant, by Roy Alonzo. This book is an extremely helpful guide that includes case studies, interviews and photo templates for business plans and the restaurant floor. Everything you would ever need to know to fulfill your dream of opening your own restaurant. Our Catch of the Day is Pacific Wild Salmon. Each year in late spring the ocean offers a great reason to continue cooking and eating because of salmon. When selecting a fresh filet, look for a light, fruit-like melon or cucumber scent. Read on for more tips on how to pick the freshest piece of salmon! Who would have thought there were so many edible flowers! In The Baking Rack with Chef Katie Averill, she teaches us about the different edible flowers used in baking such as Nasturtium and pansies. She also shares her secret of freezing rose and violet petals in ice cube trays. The decorative ice cubes make pale pitchers of water and cocktails look beautiful, and the petals simply float to the top of the glass once the ice is melted. What a creative idea! If you think soup is only appropriate in the winter months, then you need to keep reading. Our Sur Le Menu showcases sixteen different springtime soups. These soups include ingredients such as cucumber, mint, and wild thyme flowers. Try out some of our suggested dishes and let us know what you think! L’Entree encompasses all you need to know about edible flowers. Where you can purchase them, what to avoid when picking your own, how to properly store to ensure freshness, aw well as a variety of flowers and how to maximize their flavors. 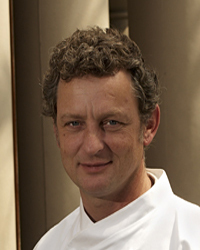 Our featured Chef of the Month is Chef Gunther Emathinger. Regional chef of Karl Strauss, Emathinger first started out on a dairy farm in Austria. Read on to learn of his accomplishments and what he is currently pursuing. Great Taste Magazine 2007 June Issue covers the restaurants and the professionals with resources, recipes, beautiful photos and many tasty tidbits. Great Taste Magazine, the premiere connection to all the key decision makers in our local Southern California restaurant industry. Each month our 15 year-old full-color trade publication reaches thousands of the area’s top restaurant owners, general managers, executive chefs and buyers. Take a tour through the magazine. Each issue features a restaurant and local chef, and is packed with the timeliest information, critical operational tips and other industry news important to our readers.